I am not much of a take out girl, preferring much more to eat in a restaurant for the complete dining experience. But with a sister visiting from out of town and the cold starting to bite, when JUST EAT contacted me to try their delivery service I decided it would be novel to take up their offer to ‘just eat’ and veg out in front of the telly. JUST EAT is a website with a list of over 18,000 restaurants from which you can order take-out to be delivered to right to your front door. Thus it expands your choice of options to beyond the few local take away restaurants that you are familiar with. JUST EAT allows you to search by locality and by cuisine, and it’s a rather user-friendly website. Given the number of options available, its difficult to know which of them is worthwhile ordering from. But the website has a neat little feature which allows previous diners to rate the food out of a possible maximum 6 stars. This helps give you a sense of how dependable the food is likely to be. We first tried Go Chisou, the take away offshoot of the well-known Chisou Japanese Restaurant with branches in Mayfair, Chiswick and Knightsbridge. 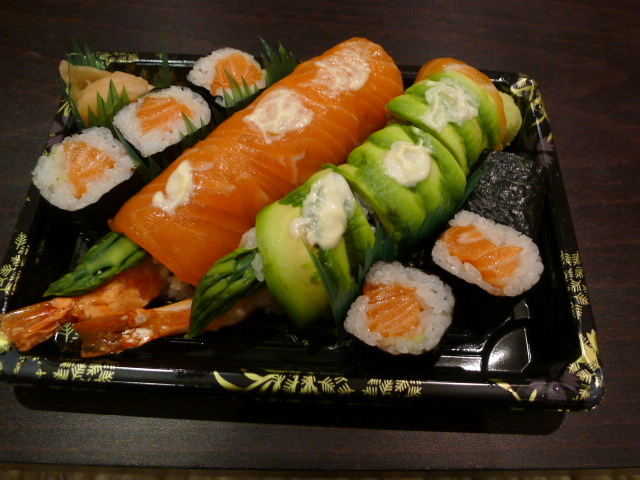 We tried a mixed sashimi salad of tuna, salmon and prawn served on some greens (£8.10); a special ebiten maki, a king prawn tempura roll with asparagus topped with salmon and avocado (£10.85); and a salmon maki roll (£3.85). 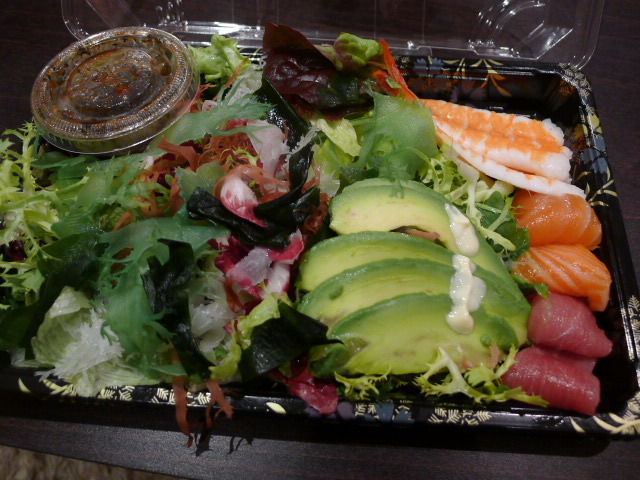 All the seafood was resoundingly fresh and delicious, and it was so satisfying to have such nice Japanese food delivered to my door without having to leave the comfort of my home. Next we tried Iranian restaurant Kish in Kilburn on the basis that it had received five out of six stars from 69 reviewers. 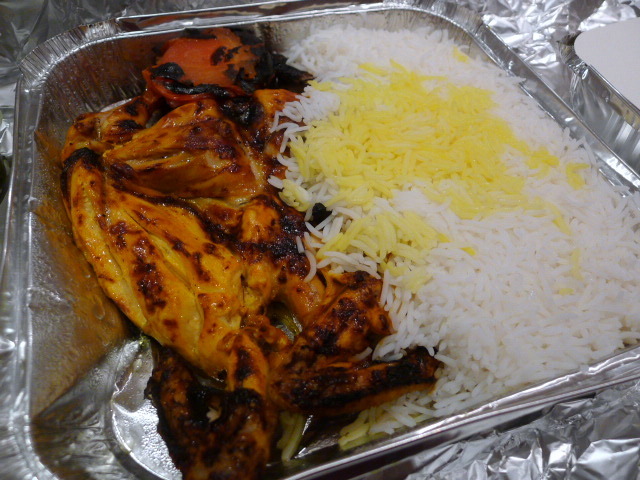 We ordered the hummus (£3.10), smoked aubergine mixed with tomato and egg (£3.80), charcoal grilled chicken wings (£3.80), charcoal grilled whole baby chicken (£11.50), and a traditional Persian lamb stew with herbs (£8.20). The delivery took about 45 minutes and it turned up nice and hot. All the food was really yummy, all the more enjoyable because it tasted homely, particularly the lamb stew. The baby chicken was really moist, a feat that is sometimes difficult to achieve with chicken. They brought fluffy basmati rice with the chicken instead of chips, but the rice was delicious and the portion size generous. It was solid, tasty home cooking and at an extremely reasonable price of about £30 for two. JUST EAT is a user-friendly website with lots of eating options. It’s worth checking out. Note that delivery charges may apply if you order below a certain amount (usually about £20).